Batman is back and still fighting crime in Gotham, now with the blessing of the police force. However, two new villains have popped up. 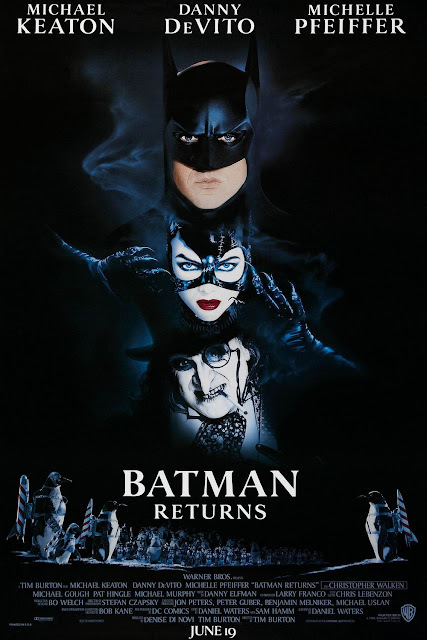 The first villain is The Penguin (Danny DeVito), a deformed man who terrorizes Gotham with the help of his circus gang, and the second is Catwoman (Michelle Pfeiffer), who is hellbent on exacting revenge on her boss Max Shreck (Christopher Walken), who pushed her out of a high-rise window. Michael Keaton. Danny DeVito. Michelle Pfeiffer. Christopher Walken. What a cast for a superhero movie! Michael Keaton returns as the dark knight in "Batman Returns." Tim Burton was once again in the director's chair, keeping the signature dark tone he started with the original 3 years prior. Upon being first released, many criticized this offering for actually being too dark, and it is. This is a very grim film because it is all about murder, and the Penguin, played by Danny DeVito, is a lustful lech that makes his desires quite known. Technically, Batman has always killed murderers, but this film was the first to really accentuate that darkness. Unlike the first of Burton's Batmans, we find this one to be a lot more Burton-esque in more ways than one. The sets, the score, the characters, and even the language are all much more "classic" Burton this time around. With "Edward Scissorhands" in between the two franchise films, we wonder how much making that movie had an impact on "Batman Returns" because they look like they could be cousin films in presentation and style. Penguin's gang are all circus freaks, performers, and clowns, and he also has an army of literal penguins with missiles strapped to their backs. Aw! Danny DeVito was the perfect choice for this villain because he looks like a penguin. Just kidding! DeVito is both grotesque to look at, terrifying in manner, and psychotic as a villain, but in a different way than Jack Nicholson's Joker from the original. He gives a wonderful performance. Besides the Penguin being added to the story, Catwoman is also a new, welcome addition to the film. Catwoman/Selina Kyle is played by Michelle Pfeiffer in what some believe is a role yet to be paralleled in greatness. Pfeiffer gives a really excellent performance, ranging from lonely cat lady to thief extraordinaire. Their origins are both covered, and Burton tried to develop his villains as much as he did his heroes. These aren't the only two villains in this film as corrupt businessman Max Shreck, played by Christopher Walken, also plays a vital role that connects Penguin, Catwoman, and Bruce Wayne. All three characters have connections to Shreck, either directly or via their alter ego, and Walken's subtle brilliance is perfect for a part like this. Unlike in the first "Batman" where Batman was viewed as a vigilante, here, he operates with the blessing of the Gotham Police department. There are many exciting scenes filled with good action, but much like its predecessor, it is a very character-driven story, and this will turn a lot of people off from it. "Batman Returns" is an overall enjoyable offering and a worthy sequel, though it is a small step down from the original "Batman." Tim Burton went a little crazy with his signature movie markers in tone, look, and sound, but this doesn't hinder our enjoyment of it. One year ago, we were watching: "Where the Buffalo Roam"